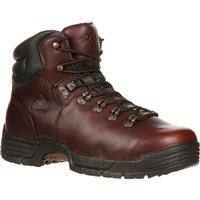 Rocky Outback GORE-TEX® Waterproof Hiker Boot is rated 4.6 out of 5 by 115. Rated 5 out of 5 by Bob66 from BOTH Comfortable & Durable! 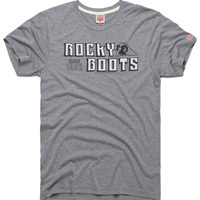 I've been buying these Rocky boots since around the middle to late '90s. 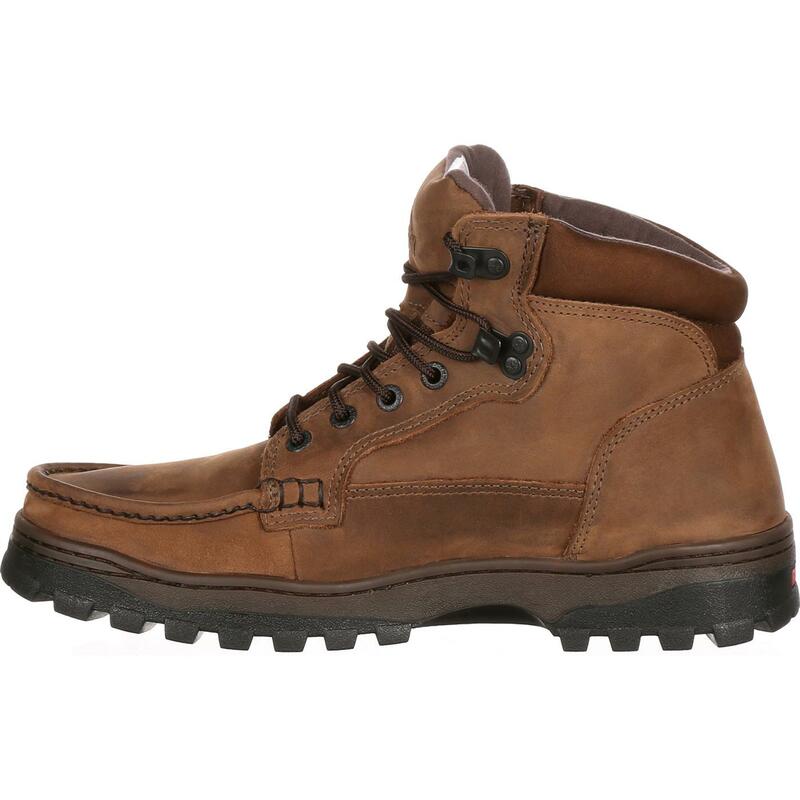 There have been some gradual changes over the years but that does NOT dissuade me from continuing to purchase these VERY comfortable boots. When I wore my first pair at Cannon Beach, OR, I could NOT believe how comfortable these boots were straight out of the box! They're LIGHTER than ANY boot I wore previously. 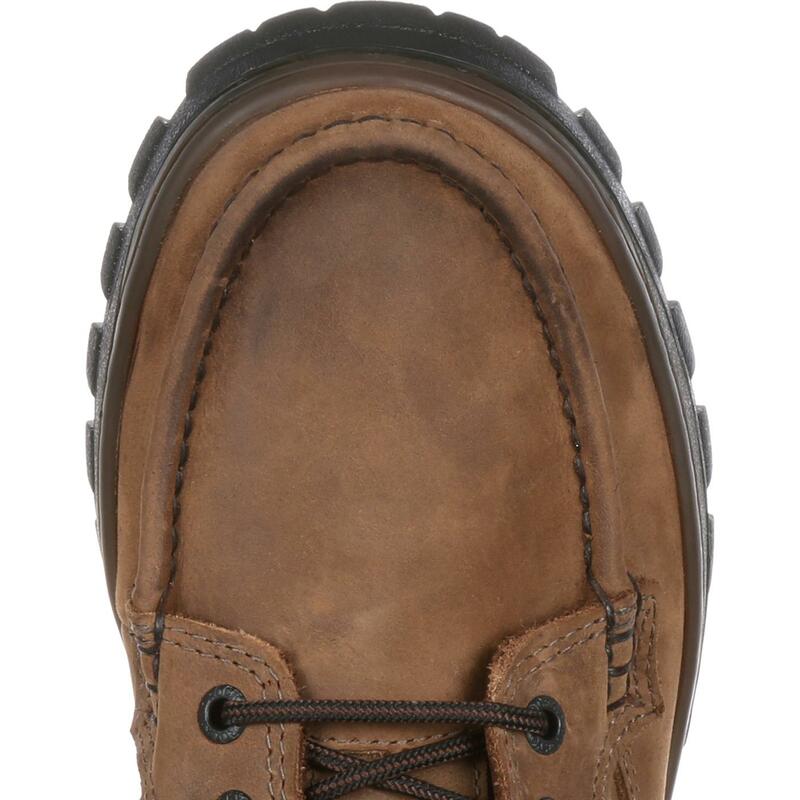 It was like wearing "moccasins" that were Gortex with excellent "traction". I had to "UP" by size by 1/2 inch (9 vs. 8.5) with boots purchased in the last eight years but STILL no issue/problem for me. MY main issue with ANY shoe is "width" but, again, the "W" works well for me. 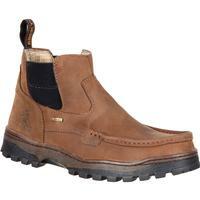 Rated 5 out of 5 by Jim05 from Fantastic from Day One My new pair of Outback boots just arrived! These are superbly comfortable from the very first minute. The quality inside and out is great. Even the removable footbed is of higher quality than most shoes. This is the third pair of Rocky hikers I've purchased in the past 35 years - they last forever and look good doing it. 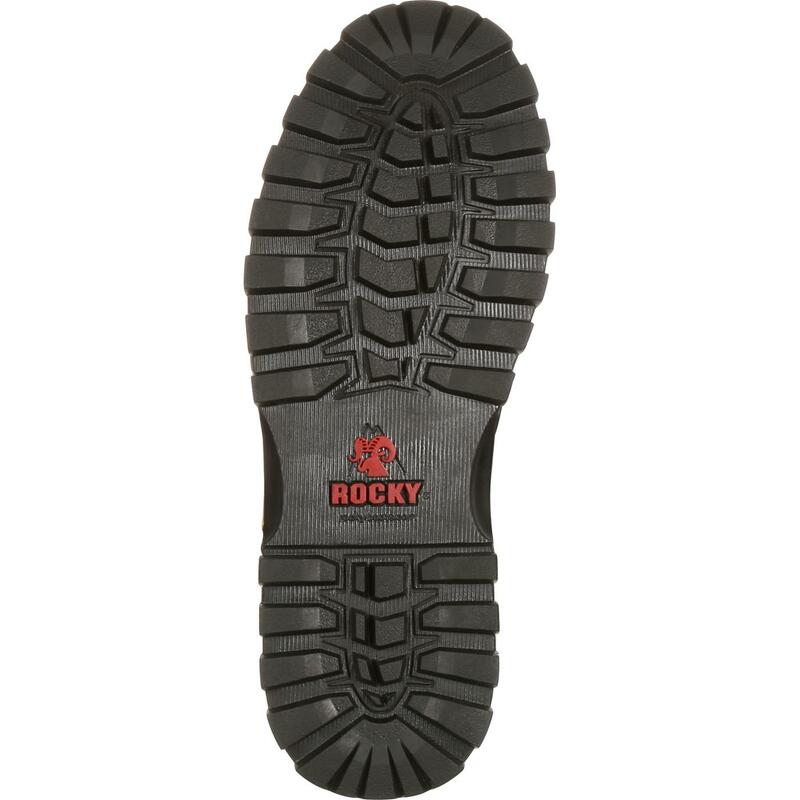 In my opinion, Rocky Boots is unparalleled in quality and comfort. I ordered 1/2 size up from normal to accommodate thicker hiking socks and the fit is perfect. Can't wait to test out the Gore-Tex waterproof feature - I have every confidence that they will pull through. Rated 5 out of 5 by Zach Thompson from Really efficient hiking boot I was going to the Rockies and needed a water proof hiking boot that was tough, I'm from the flatlands (central Texas) and down here a work boot and hiking boot can sometimes do both jobs. So all I had was a flat soft soul boot. These boot saved my feet. They are tough, water proof & the most impressive feature, they were extremely light weight. I've never owned a boot that tough and that light. 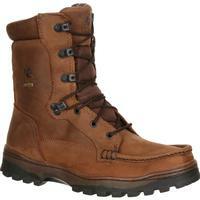 So in my opinion a great boot for long hikes, they protected my feet and allowed me to hike for a long time. Added bounes. The "mock" toe looks pretty good with pants, so I even wear them casually sometimes. 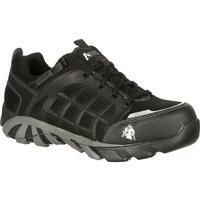 Rated 5 out of 5 by kwcwell from Quality I bought these today at the outlet store in Nelsonville OH. Right out of the box extremely comfortable and appear to be very sturdy. I bought these because I think I will be able to wear them with slacks at work during the winter months. However they are so comfortable these boots might become my go to's. 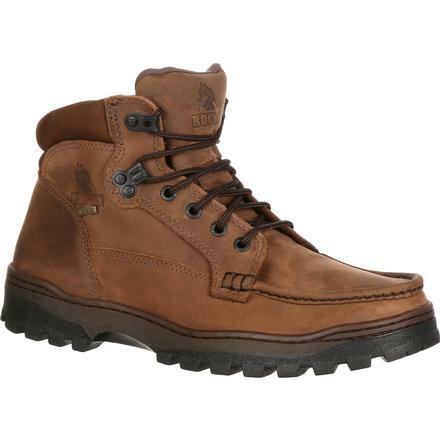 We went hiking directly after the purchase and the boots were comfortable and held up well on the snowy/icy trails. **Just a heads up, I normally wear a regular size shoes/boots but these boots were a little snug and fit much better in the wide. 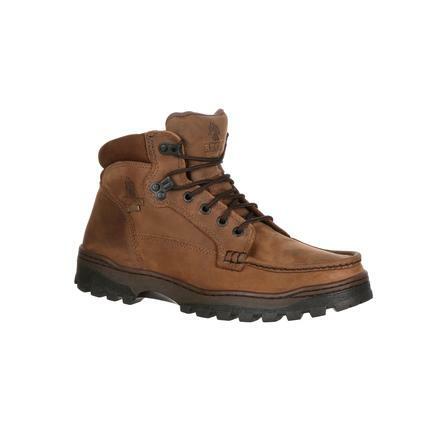 Rated 5 out of 5 by Shroom from Just bought second pair I have been wearing the Outback 8” boots daily for about 18 months. The tread, seams, insoles, and gore-tex are holding up extremely well. I was working retail sales, and now work in a manufacturing plant. Great all-day support! I didn’t need to buy this second pair now, but jumped on a deal at my local Outdoor shop. Prior to the Outback, I wore the Merrel Moab for three pair, or about 5 years. The Rocky Outbacks hold up much better, and stay waterproof much longer than the Moab. Great boot! Rated 4 out of 5 by Atticus from 100% Flinstone Footwear! For guys like me with "thick" or tall feet it's important to have a shoe that accommodates that. The Chukka is my go to style for that. 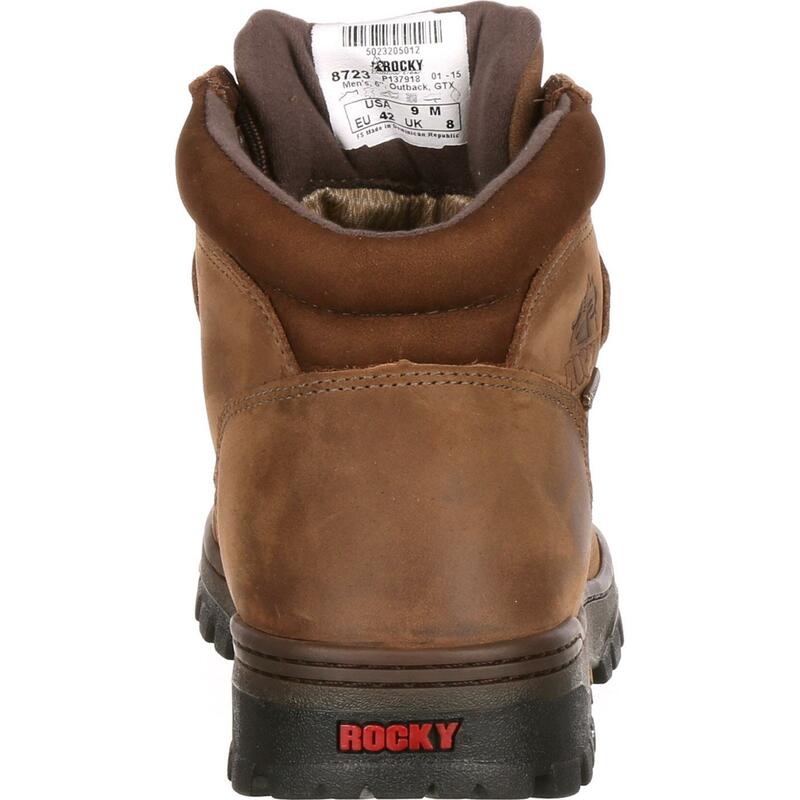 Rocky makes this boot perfectly rounded with the waterproof feature. Couple that quality design, fantastic craftsmanship & a company that I have experienced stands behind it's product & this is a no brainer. The ding is just for ascetics because I would like to see an arch on the sole on the inside at least. 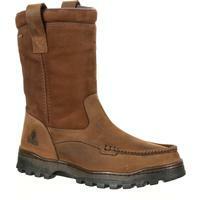 This has Zero impact on the boots comfort or performance. I am wearing these as I write...I almost forgot because they are my slippers. Rated 5 out of 5 by dackmd from Great boot This is my second pair,,my first was about 18 years ago. A very comfortable, long lasting boot. One problem is the size. About every Rocky Boot I've bought is a size up from what I normally wear. The width is a wide and normally I am a medium. 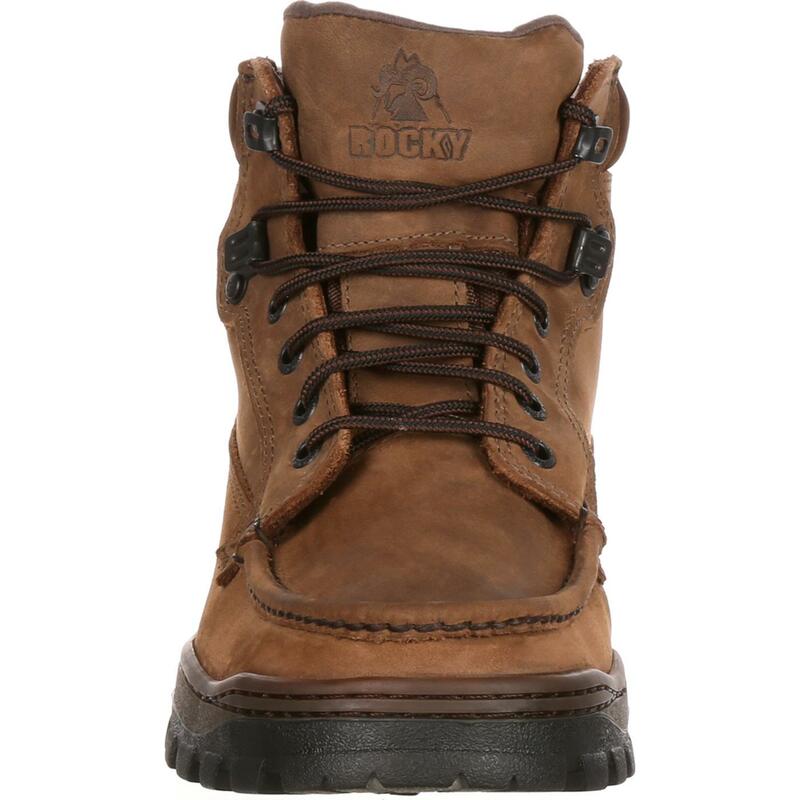 I have about six pairs of various Rocky Boots, never had a bad pair.